In Sudan, the Abu Halimah Greenhouse Project used the group value chain approach to support small agribusinesses. Photo credit: Islamic Development Bank. The Islamic Development Bank shares its experience in microfinance and group value chain financing to improve access to credit in rural areas. Conventional microfinance institutions have been notably successful in providing affordable access to credit in rural areas. Still, it is fair to ask how conventional microfinancing compares with Islamic financing, and which might work best in Muslim countries. Both Islamic and conventional microfinance concepts provide the same three financial services to help the poor: build income generating assets; stabilize consumption; and protect businesses from future risks. Islamic microfinance institutions started in a way similar to how conventional financial institutions began—but they have adapted the conventional model to comply with Islamic principles. It was no surprise that most started with murabahah financing (fixed returns finance contracts) and as a result, their effectiveness as a means of poverty alleviation remained limited much the same as their conventional counterparts. Islamic microfinance in its initial practice was providing all the benefits that conventional microfinance was providing and ended up being constrained by the same limitations of conventional microfinance. It is faced with the challenge of reducing the cost of financing in addition to the extra burden that the complexity of Islamic financial instruments brings to the overall process of financing. Microfinance institutions implementing Shari’ah-compliant instruments comply in the form of financing but struggle in realizing the value of conducting trade and investment with its clients. What is a murabahah transaction? In a murabahah transaction, the microfinance institution purchases an asset on behalf of the client and sells it to the client at a profit. The client approaches the microfinance institution with an invoice from the supplier for what they need to purchase (such as seeds, fertilizer or other inputs). The bank transfers the funds to the supplier and sells it to the client at a profit, which is to be repaid on a deferred basis. An effective Islamic microfinance institution has to behave more like a trader and investor than a banker. Compared to a banker, a trader will add value to the transaction by: providing transportation services; purchasing in bulk at wholesale prices; taking ownership of the traded goods; and marketing the goods. Those features distinguish an ideal Islamic microfinance institution as a risk-sharing institution, which is a clear departure from the usual banking culture and mandate. In conventional finance, engaging in business transactions is seen as an unnecessary liability of which financial institutions should stay clear. Islamic finance does not differentiate between the financier and the investor functions and mandates that Islamic microfinance institutions mediate (take and deploy) funds in the most efficient and prudent manner. The mindset of such an institution is to focus on business-related risks more than repayment-related risks. Financing will be provided on the basis of prevailing business opportunities rather than the ability to repay the financing. Islamic microfinance institutions have the freedom to engage in the value chain and conduct business with their clients. By doing this, Islamic microfinance serves not just to provide financial inclusion, but it also helps to democratize business opportunities. Furthermore, they should be able to negotiate a lower price for assets they are purchasing on behalf of their clients. Over time, they can better understand the needs of their clients. They can identify popular products and suppliers and negotiate preferential trading agreements as wholesale agents. Alternatively, they can directly purchase seeds or fertilizer from the suppliers in bulk and sell them to their clients when the demand arises. Recently, Islamic Development Bank’s (IsDB) interventions promoted the adoption of a comprehensive economic empowerment approach through a full merging of financing, partnership, investment support (value chain financing) for small and medium-sized enterprises, and other non-financial services. IsDB programs in this sector provided a more sustainable and effective model for combating poverty. Those programs have provided solid evidence of positive impacts, as illustrated by the following two case studies on how IsDB’s interventions increased access to affordable financing in rural areas. How have financial institutions realized higher returns by operating as a trading business? Traders operating in rural areas often function like a monopoly and generate high profits at the expense of poor farmers. Farmers will not be able to convert their labor in the field to revenue so long as they fall victim to two types of sharks—the “loan shark” and the “middleman shark.” Middleman sharks often go to rural areas to purchase agricultural products on the cheap from desperate farmers. In many cases, these two sharks are the same person and their activities enslave large communities who remain trapped in the poverty cycle. In Palestine, under the Deprived Families Economic Empowerment Program (DEEP) financed by IsDB, the microfinance institution provided raw materials and working capital through a salam (an advance purchase) agreement with women cooperatives. Palestinian women are well known for their expertise in producing maftoul (Palestinian couscous). The microfinance institution orders the amount of maftoul to be produced and pays the women cooperatives upfront. After the agreed period for delivery, the microfinance institution receives the maftoul and then exports it to the European Union. What is a salam transaction? Salam transactions are excellent for providing working capital to small businesses especially in the field of agriculture. Salam not only provides working capital to farmers, but it also assures them of a market. Microfinance institutions will purchase the product from a farmer at a discounted price and advance the cash to him or her for purchasing inputs, labor, etc., to be delivered during harvest 6 months later. In order to profit from the transaction, the microfinance institution will negotiate with a buyer to sell the harvest that it is expecting to receive. The microfinance institution in the maftoul value chain role provides advance financing for raw materials; it brands, labels and packages the product so that it is ready for export. It ensures that product quality meets high European standards, and then collects and sells the maftoul to exporters for a profit, as illustrated in Figure 1. MFIs = microfinance institutions, EU = European Union. By using a business trader approach (Islamic finance) both parties, the client and the microfinance institution, enjoy the fruits of success. Through salam financing, suppose each woman needs $500 to buy seeds to sell $1,000 of maftoul. Since the target profit rate is 20%, the microfinance institution contracts the maftoul for $833 (1,000/1.2), and negotiates with a buyer to sell it at a 30% markup at $1,300. The transaction returns 50% in additional profit, $300, out of which $150 was realized by the clients. The IsDB-supported microfinance institution was able to generate a more significant profit for itself and its client by playing the role of a trader. The 30% discount negotiated by the microfinance institution is actually the middleman’s rate that currently exists in the value chain. Hence, by cutting out the middlemen, their benefits are taken by the microfinance institution and shared with its clients, resulting in a win-win scenario. This was possible because the Islamic microfinance institution was able to negotiate with the buyer and obtain a higher price than the client could. On the other hand, if the maftoul produced by the women falls short of the quality required and needs to be discarded, the loss will be shared. In this case, the women’s cooperatives (the clients) will lose the amount they invested in inputs ($500) if they borrowed from the Islamic microfinance institution. If they borrowed from a conventional microfinance institution, they will still be liable to pay the principal and interest due ($650). Hence, the women will bear less risk ($150 less) by engaging an Islamic microfinance institution. The Islamic microfinance institution will also lose the potential profit from their sale to the exporter (calculated at $181), although no actual direct loss is incurred. Each stakeholder in the value chain bears some form of real business risk, which goes beyond credit risk in the conventional model. By sharing the risk, the Islamic microfinance institution has an intrinsic interest in ensuring the success of the transaction. Its risk is derived from its role as an aggregator of maftoul from the women’s cooperatives, its responsibility to ensure product quality, and most importantly, as the marketer of the maftoul. Islamic microfinance institutions helped farmers gain access to markets. As an aggregator, they are in a good position to negotiate with larger buyers for better prices. If financial institutions were to operate as a trading business, they would realize that there are a lot of opportunities in rural areas. How has the group value chain approach benefited smallholders? The IsDB-supported Abu Halimah Greenhouse Project started in May 2011 through the Microfinance Unit of the Bank of Khartoum in Sudan. Instead of providing small loans, which defines the microfinance industry, the bank ventured into grouping small/micro projects into one large project. Large projects were developed involving hundreds and in some cases thousands of beneficiaries, with investments of up to $3 million each. This approach was found to be more sustainable and more effective with an internal rate of return (IRR) of about 20% per annum. Each beneficiary earned more income by sharing in the venture’s profits and being co-owners. By being a real partner in operating these businesses, the bank developed its expertise in the area of agriculture and livestock development. Agricultural graduates conceived the Abu Halima Greenhouse Project. Many of them were unemployed or were working on farms for very low pay and wanted to create an opportunity to work and reap the fruits of their labor. These graduates formulated an initial business proposal and approached the bank for financial backing. The business proposal was further developed jointly by bank staff in coordination with community groups. A consultant was hired by the bank to support the graduates (the clients) in developing their business ideas into operational plans with the various Islamic finance instruments that may be provided to targeted clients. 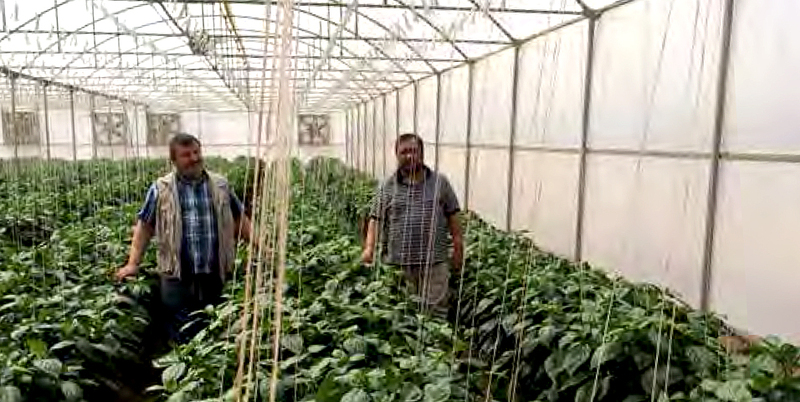 The project rested on an innovative idea of producing winter crops (such as tomatoes) during summer, producing them in a controlled greenhouse environment. During the summer, imported tomatoes cost five times the locally produced ones sold in the winter. In addition, the greenhouses are able to produce high-value crops that are usually imported during winter (peppers, for example). The bank refined the business proposal in consultation with the graduates and submitted the proposal to the investment board for approval to commission a detailed feasibility study. During this period, a strategic technical partner, a Turkish consultant, was hired to train the graduates on how to manage the greenhouses and the business. Based on the feasibility study, the Bank of Khartoum’s board approved 10.90 million Sudanese pounds ($3.27 million at that time) with the possibility of increasing it up to SDG15 million (then $4.50 million) in the form of a trust financing contract, or mudaraba. The bank ceded control of the project after the 5-year implementation period. Its investments were for constructing 25 productive greenhouses, each with an area of 1,710 square meters and composed of five tunnels of 342 square meters each. Agricultural graduates who applied to be part of the project underwent a thorough interview that tested their capacity and commitment. During the 5-year implementation period, the graduates received about SDG2,700 ($810) per month, about 40% of the profits generated from the project. Since the key to the project’s success is being able to sell all the high-value “off-season” crops, the bank negotiated master contracts with large supermarkets, such as Home Centre and Sanaa. One interesting feature of this project is that there is no requirement for collateral or third-party guarantees. The graduates signed a personal guarantee to remain committed to the project throughout the 5-year implementation period. The Bank of Khartoum reserved the right to remove any graduate and replace him or her with another if the graduate is not serious or committed to the project. At the end of the fifth year, all of the project’s assets (estimated at SDG10 million) were transferred to the Graduates Association (made up of the 125 selected graduates) after which they expected to receive at least SDG6,750 a month from the produce. Another interesting feature is that as Rab-ul Mal (investor or provider of funds), the Bank of Khartoum had the right to extend the mudarabah for another year due to crop failure or other unforeseen circumstances. Therefore, the bank had a buffer of 1 year to ensure its target returns for the investment were met. The bank ensured the welfare of the graduates. The target returns during project implementation were more than what farmers would have earned if they worked on their own or if they worked on another farm. At the end of 2013, the default rate was around 12% for individual murabahah financing, while in the project financing the figure was only 3% (Alsagoff & Surono, 2016). This rate is much better than the countrywide average of 22.9% in nonperforming loans after 90 days (PAR>90) or the PAR>30 average of 28.6%, but is relatively high compared with the averages in the African region (2.3% and 1.7%). According to the Bank of Khartoum, this is due mainly to the deteriorating economy. The project financing’s weighted average return on investment (ROI) was 18%, above the ROI of individual murabahah financing of 14% in local currency. The profitability was at a competitive level with the median market benchmark, which was 1.8% in hard currency at the time. Sudan as a whole has experienced extraordinary inflation, and a mere 18% ROI may be considered a bit thin to cover the inflation abrasion. However, the profit should be benchmarked using the prevailing inflation rate (11%–12%) when the project was conceived, and therefore an 18% local currency profit is a promising and fair rate for such businesses. In terms of sustainability, operational self-sufficiency stood at 1.3—above the country average of 1.1, though slightly below the Africa average of 1.4. A business officer of the bank, the equivalent of a credit officer, services around 20 clients on average, while in the project financing, the average number of clients per officer is 60. The nature of group financing in a localized project area enables the business officer to operate more efficiently and monitor the business more closely. The business officer is deeply involved in the financed business, contributing financing expertise and building the capacity of the beneficiary at the same time. With the help of a technical partner, the business officer can also identify the business-associated risks together with the beneficiaries and discuss risk mitigation measures. IsDB microfinance interventions have demonstrated that value chain project group financing can be very effective in developing sustainable business models that entail financing for the rural poor. Islamic microfinance institutions are typically in direct violation of central bank restrictions on microfinance institutions purchasing assets. In conventional microfinance, there are procedures for lending and procedures for procurement. However, in Islamic microfinance, there are procedures for procurement and procedures for sale. So, on the one hand, it complicates matters for the institution, but on the other, it facilitates things for the beneficiary. Value chain group financing projects require more commitment in terms of resources, as well as financing size. This dedication of resources and high overhead can only be compensated in projects that are larger in scale. IsDB has found it difficult to encourage microfinance institutions to move away from microcredit and take up an active role in business ventures. Existing microfinance institutions and funds are based on the Grameen model of microcredit, and it will take significant effort and the right government policies to change their mindset from providing microcredit to embracing a trading business approach. Larger institutions compared with smaller ones are more hesitant to change, requiring capacity building to change mindsets from top management down to the staff level. Staff that come from banking backgrounds have difficulty in accepting other methods that require understanding and being involved in business operations. This approach works well in rural areas where market failure is common. Careful study is needed by microfinance institutions to understand the causes of market failures in order to generate successful business solutions. Microfinance institutions can develop sustainable rural businesses that effectively provide sustainable incomes to poor villages. Any microfinance institution that is interested in providing Shari’ah-compliant finance needs to develop its capacity in three areas: (i) the systems, processes, and documentation needed to implement Shari’ah-compliant financing; (ii) the economic activities undertaken by clients and the opportunities that arise from being an active participant; and (iii) how to engage with various stakeholders within the value chain in order to add value for the clients. It is critical to pilot and then scale up the value chain group financing project model in other regions and settings, which may complement the existing Islamic microfinance model and add to its potential for supporting small agribusinesses that contribute to poverty alleviation, financial inclusion, and equitable economic growth. Governments should empower microfinance institutions to strengthen the rural economy by changing the regulatory framework to enable additional services. Financial Institutions should endeavor to improve their ability to operate more widely and develop other innovative modalities in line with clients’ needs and desires, while observing the essence of Islamic financing regulations. This article was adapted from Change for Impact—Transforming Agriculture and Rural Development in IsDB Member Countries. K.E. Odell. 2015. Measuring the impact of microfinance: Looking to the future. Grameen Foundation. Washington DC, USA. M.S. Robinson. 2001. The Microfinance Revolution: Sustainable Finance for the Poor. World Bank. Washington DC, USA. Development. Change for Impact—Transforming Agriculture and Rural Development in IsDB Member Countries. pp 101–111. Jeddah, Kingdom of Saudi Arabia: Islamic Development Bank. S.H. Alsagoff and A.O. Surono. 2016. Empowering the Poor through Islamic Microfinance: Experience of the Bank of Khartoum in Value Chain Project Financing in Sudan (No. 1437-3). The Islamic Research and Teaching Institute. IsDB. Jeddah, Saudi Arabia. He has designed and is managing a portfolio of projects amounting to more than $780 million in Indonesia, Bangladesh, Maldives, Albania, Jordan, Egypt, and Yemen, mainly in the fields of Islamic Microfinance and SME Finance. His role at IsDB involves decentralizing operational activities to regional hubs. Prior to this, he was senior rural and microfinance specialist in the Agriculture and Rural Development Department, handling a public financing portfolio mainly related to access to finance (microfinance, rural and agriculture finance), youth employment, rural infrastructure, and community development. He covers countries in Central Asia and Sub-Saharan Africa. He has designed, appraised and supported the implementation of Micro, SME and Rural Finance projects and components in West Africa and carried out project post evaluations in Southeast Asia and MENA regions. He is currently a focal point for advisory and technical assistance support for Islamic finance.